Egan, one-fifth of the chart-toppers signed by Cowell, said the X Factor judge quickly backtracked on his comments when asked to clarify them - although Egan admitted two of the band were ugly. Speaking to Phil Williams on BBC Radio 5 live, Egan joked that former bandmates Nicky Byrne and Brian McFadden were the least attractive because they were both Dubliners. The rest of the band are from Sligo. The 34-year-old, who was crowned king of the jungle in last year's I'm A Celebrity... Get Me Out Of Here, said: " I interviewed him (Simon Cowell) a few weeks ago for a television show and I asked him: 'So come on you say Westlife was the ugliest band you ever had,' and he said: 'Well now kiddo, I wasn't talking about you...'"
According to Egan, Cowell said when he first saw the band in the late 1990s, one of his initial reactions was "that you were the ugliest looking band". Egan said: "I understand where he was coming from because the band that he first saw, is not the band that he signed. "As time went on, the band changed, there was six of us originally, and then when Louis (fellow X Factor judge Walsh) started managing us, and when we met Simon, Louis started changing people in the band for a while....and it only ended up being me, Shane (Filan) and Mark (Feehily) from the original line up. "Then we brought in Nicky and Brian, and that was the band Simon Cowell signed." Asked to name and shame who was lacking, aesthetically, in the band, Egan replied: " Nicky and Brian were the ugly ones, because they from Dublin." Westlife split up in 2012, and Egan said there was a definite chance they would perform again. 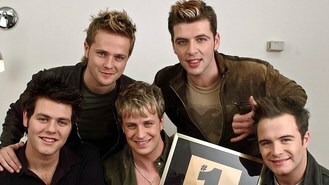 He told the BBC: "There is no talk of a Westlife reunion whatsoever. It's only two years ago since we broke up. "I think everybody is just doing their own thing as individuals right now. Westlife is an amazing part of our lives, but you know, we are doing other things as individuals rather than as a band. "I want Westlife to get back together, at some point in my life. That's the real answer from my part. "We did it for 14,15 years, since we were teenagers. I think it is important for us to be on our own and live life outside the Westlife bubble for a good five to 10 years, would be my guessing."